Celebrate Independence Day with private sailing charter on Lake Michigan! We've created a special sailing charter that combines the sunset sail and fireworks cruise into one 3 hour sailing charter. 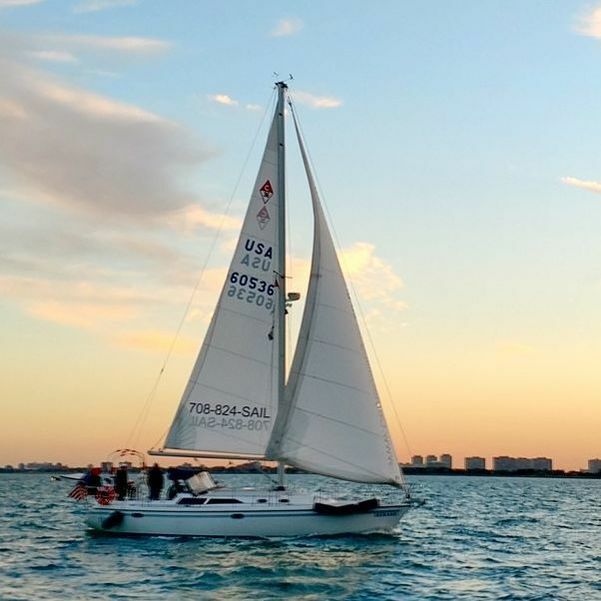 The itinerary includes a relaxing sail along the Chicago lakefront for an amazing view of the sun setting behind Chicago's beautiful skyline. Then we'll get into position for a spectacular Fourth of July fireworks display. We'll have the best seats in the house because...well...we're on a boat. So it's already awesome! But the fact that we are on a sailboat means that we can easily maneuver to an optimum viewing spot. We'll stay up wind and get as close to the fireworks barge as the Coast Guard will let us. The sound of the fireworks exploding just overhead is incredible. The view is simply amazing as the sky above fills with bright explosions of color. Of course the best part is the finally followed by a salute from the spectator fleet. If you've never experienced the Fourth of July fireworks this way, you should. ​Come Sailing is Chicago's premier private sailing charter offering a variety of private charter experiences on Lake Michigan. Your Chicago sailing adventure starts here! All charters are private. The passenger list is at your discretion. * Standard charter duration is 2 hours. Call us if you would like to extend your time on the water.